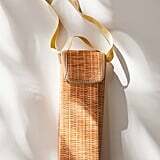 If you've ever yearned for a stylish straw bag that fits nothing but a bottle of wine . . . well, same. Finally, our dreams have come true. Urban Outfitters just dropped a slew of new bags for Summer, and this Kikkerland Design Wine Tote Bag ($5) is definitely our favorite. 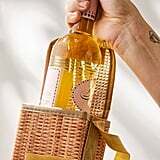 Perfect for BBQs, picnics, and "BYO wine" festivals, this cute bag is a total win-win in our books. The insulated tote features a foldable closure secured by a hook and loop strip to keep your precious bottle safe and sound. Plus, its carrying handle is the perfect size to throw over your shoulder. So what are you waiting for? This bag is likely to sell out fast, so keep scrolling to shop and get one for yourself.